So I recently removed Windows 7 from my iMac, but Bootcamp didn't let me do it. I used Disk Utility instead. The old Windows 7 partition now shows up as free space. I want to reinstall Windows 7 again on my iMac, how do I set it up? Can I use the free space again? I want to give the Windows partition a bigger size than what the free space currently holds. 40      409600      1  GPT part - "EFI system partition"
409640  1565127200      2  GPT part - "Macintosh HD"
1565536840     1269536      3  GPT part - "Recovery HD"
Start another computer or smartphone and access this page here to follow the instructions. Alternatively you may start from a bootable installer thumb drive (Mavericks or Yosemite) or a thumb drive containing a full system (Mavericks or Yosemite). Check the volume 'Macintosh HD' with Disk Utility and repair it if necessary. If the volume is corrupted beyond any repair consider a reinstall of Mac OS X. Copy the UUID of the Logical Volume (lvUUID). It's the fourth listed. After a successfull conversion enter 'exit' and quit Terminal. I am glad, klanomath posted his answer. For me post, I would have to plagiarize his work. Deuce55 you can ignore this update. It is directed at anyone interest in recovery partitions. There are three types of OS X recovery partitions. They are either internal, external or internet based. Each type has its pros and cons. Internet recovery is the most reliable, but for my old 2007 iMac this is not available. For the 2011 iMac, it takes 33 minutes at my Internet Connection Speed of 2.3 Mbps. If you use internet recovery to do a clean install of OS X, you get the version of OS X that the computer was shipped with. This is not a problem if your computer is new, but later you will have to visit the App Store to get the last purchased version. If you have to do that, then I no longer consider the install to be clean. An external recovery partion is usallly stored on a thumb (flash) drive. Using a thumb drive, for me, is much faster than the internet. You do have to download the “OS X Recovery Disk Assistant v1.0” application to create the thumb drive, but that is a minor inconvenience. Like Internet Recovery, it is reliable assuming you refresh the thumb drive after each major OS X upgrade. When used to do a clean install, you get the verion of OS X that was installed when the thumb drive was created. So if your OS X is current, then the clean install will also be current. The disadvantage with thumb drives is the “OS X Recovery Disk Assistant v1.0” is “not compatible with a disk that is using CoreStorage, including any disk larger than 2.2TB, any disk with FileVault 2 enabled, and all Fusion drives.” See System Requirements. Finally, there are the hidden recovery partiton(s) on the internal drives. For most users, there is only one internal drive and therefore only one recovery partition. For Fusion drives there appears to be two. Booting by using these partitions is probably the fastest. Clean installs result in the installation of the same OS X version, which is good. But consider the bad. First they can be corrupted. If your drive physically fails and you replace the drive, then you have lost the use of the recovery partition. If you delete the OS X boot partition, often the recovery partition is also deleted. Finally, if you boot using the internal recovery partition(s), you can not unmount /dev/disk0. Any chance you would be willing to try posting the output from the commands I asked for? Also, do you have a thumb (flash) drive that you can reuse? If so what size? And, do you have another computer available to communicate with while this computer is in recover mode? Yes, you will probably what to back up your OS X partition to an external disk before proceeding. Have you ever created a .dmg image using the Disk Utility? It looks like you are using Core Storage. If you are, then what bjb is telling you to do may not work. The resident expert on this subject is klanomath. I would recommend one of his solutions but first could you answer some questions. This would help me determine what link to create. What is model identifier or Model/Year of your Apple? Are you using Time Machine or other method of backup.? If you still have your recovery partitions, do you care if you lose them? Could you enter the following commands in a terminal application window and post the output. The last one will ask for your login password. This is normal. None of these commands change your computer. They just show your current disk setup. If I remember correctly, if the partition type is GUID then you should be able to resize by just dragging the line that divides your partitions. You might need to delete the empty space partition first by clicking on it and hitting the '-' button, but then you should be able to drag the active partition to whatever size you want. Afterwards, you can '+' the partition back and format it for Bootcamp. I haven't done this in a while, but from what I remember the only requirement was that you needed to have the GUID partition type for this to work. Otherwise, you'd have to reformat the entire drive. The disk utility program should attempt to relocate the blocks that were in the space that you're now moving to your bootcamp partition. Not the answer you're looking for? 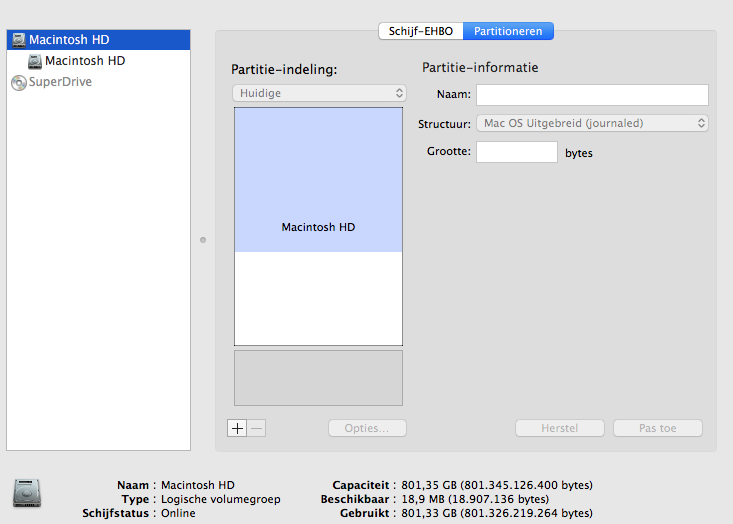 Browse other questions tagged yosemite bootcamp disk-utility partition core-storage . Reclaim disk space from old Windows partition?